Earlier this week a US Navy guided-missile destroyer sailed close to the Subi Reef, which is part of a series of artificial islands built by China, in the South China Sea. China claims to have sovereignty over the territory, but it’s not the only country making that claim. The United States does not recognize those claims. The incident has caused tension between the two nations. 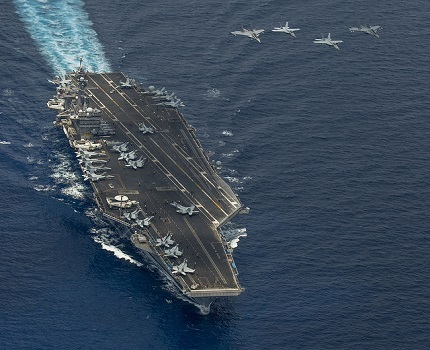 We’ll take a look at what’s really playing out in the South China Sea with Robert Daly, director of the Kissinger Institute on China and the United States at the Wilson Center. Guest: Robert Daly is the director of the Kissinger Institute on China and the United States at the Wilson Center. Some recent reports and research has found that Joseph Kony’s Lord’s Resistance Army (LRA), an African Christian militant group, has been reduced to just a little over 100 men. But a new report by the human rights NGO, the Enough Project, says that despite small numbers, the LRA still wreaks disproportional havoc by conducting increased abductions, forced recruiting of child soldiers and illegal ivory trading. We’ll talk about the report, Tusk Wars: New information on the blood ivory trade of Kony&apos;s Lord&apos;s Resistance Army, with Sasha Lezhnev, the Enough Project’s team leader of the D.R. Congo, Great Lakes Region and LRA team. He focuses on peace process and conflict minerals issues. Guest: Sasha Lezhnev is the associate director of policy at the Enough Project, where he leads the D.R. Congo, Great Lakes Region, and Lord&apos;s Resistance Army team. He is also the author of the book ‘Crafting Peace: Strategies to Deal with Warlords in Collapsing States’. WOMEX 2015, one the most important gathering of international music professionals (2500 delegates from 90 countries) just wrapped up. This year the event was held in Budapest. This 21st edition of WOMEX showcased more than 60 musical acts from 50 countries and was the first edition to be held in Central Eastern Europe. Our far-flung music correspondent, Catalina Maria Johnson (host and producer of Beat Latino, which airs on Vocalo) visits Worldview to share some of her favorite tunes and moments from WOMEX 2015. Tony Sarabia is the host of WBEZ’s Morning Shift and Radio M.
Catalina Maria Johnson is the host and producer of Beat Latino, which airs on Vocalo.